Engine 65-1 - 2005 Pierce Lance 2000 gpm/750 gal. Featuring dual Roto-Ray warning lights, this rig is equipped with a 20 kw generator, light tower and 2,000’ of 5” LDH supply line. Garden City operate their entire fleet from this five bay station. 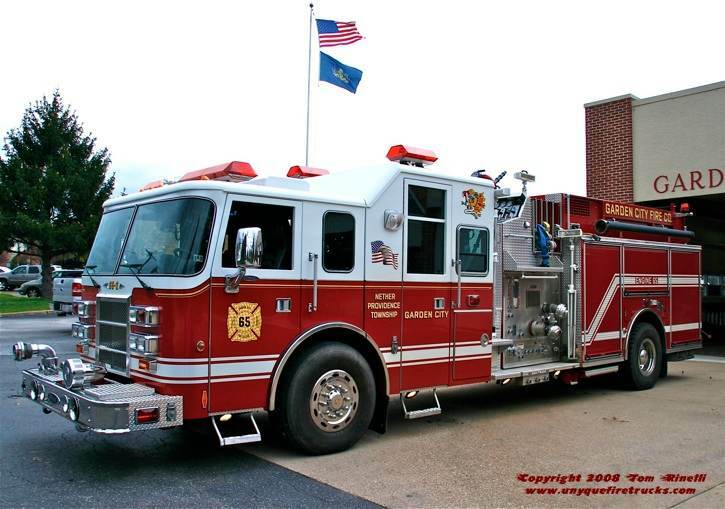 Engine 65-2 - 2001 Pierce Lance 2000 gpm/750 gal. Seating ten (9 with SCBA plus 11 spare cylinders), this rig is well equipped with a 20 kw PTO generator, four crosslays, 2,000’ of 5” LDH supply line, 100 gallons of Universal Gold AFFF foam, two 200’ electric cord reels, 80 pounds of absorbent, a 4 gas meter, cribbing & BLS medical equipment including an AED. 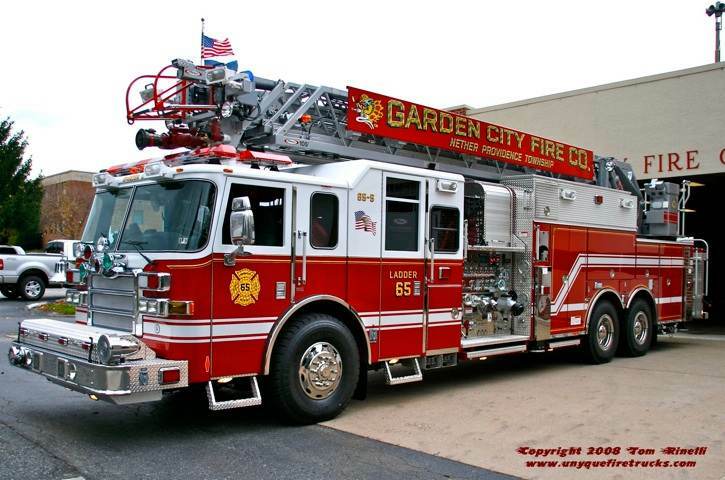 Ladder 65-5 - 1994 Lance 105’/2000 gpm/300 gal. 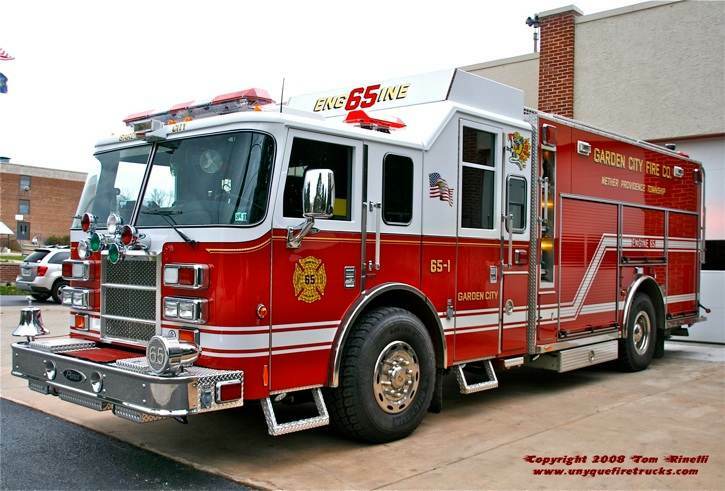 Featuring seating for ten (each with SCBA plus 11 spare cylinders), this rig is equipped with a 20kw PTO generator, 178’ of ground ladders, 4 crosslays, two 150’ high rise packs, a thermal imager, six saws (assorted types) and high angle rescue gear. Special thanks to Chief Joseph Lombardo & the members of Garden City Fire Co. for their assistance in positioning the apparatus for photos . 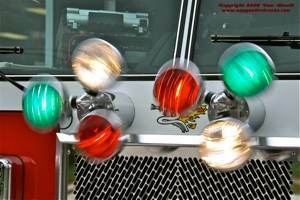 You gotta love the dual Roto-Rays!!! 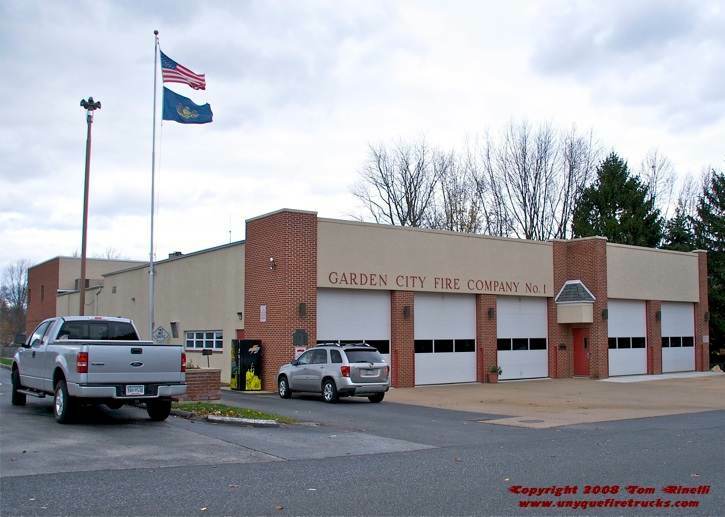 Organized in 1944, Garden City’s volunteers provide fire protection to Nether Providence Twp. & Rose Valley Borough as part of the Nether Providence Township Fire Department along with their sister company the South Media Fire Co.